When you go to the music section of any bookshop nowadays you'll see any number of books detailing and documenting in photos the story of a plethora of bands, solo singers, musical events and scenes. It's an industry and it goes with the territory that where there are photos available there will one day be published a book of them; and long may it be so, I say, as it's a genre of books I quite enjoy. The Internet has obviously had an effect on this once-cornered market of photo-documentary books, particularly platforms such as tumblr, which is a very good thing, I think. For all that, however, you still can't beat the physical medium of looking at photos in a book (or a magazine) as opposed to viewing them on a screen. And you never will. Published in 1960, The Beat Scene is probably one of the first of this kind of book. Edited by Eliaz Wilentz, it documents as it says in the blurb on the back cover, 'the world of the young bohemian writers of New York's Greenwich Village'. To this end, it includes a large number of black and white photographs of all the poets of that time who whether by accident or design had picked up the mantel of 'Beatnik'. Alongside the photos there is also one poem from each of them plus essays from others describing the beat scene. The photographs themselves capture a sense of something very fresh and exciting happening, particularly in those depicting the poets in full flow, reciting their poems to a rapt and attentive audience. 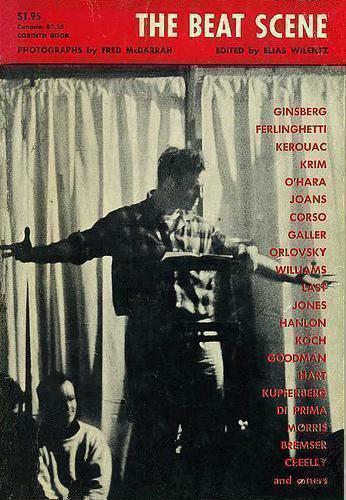 All the usual suspects are here - Allen Ginsberg, Lawrence Ferlinghetti, Jack Kerouac, Gregory Corso, Peter Orlovsky - but also a whole host of others that I'd never heard of before. Regarding the poems themselves, two stand out: Playmates by Ted Jones, and Tentative Description of a Dinner Given to Promote the Impeachment of President Eisenhower by Lawrence Ferlinghetti; both for the simple reason of having a political edge to them. And being politicised - much to the chagrin of Jack Kerouac - was what gave the Beats an edge which without having would have left them as being just a bunch of would-be-poets writing about clouds and chasing butterflys with nets in the countryside. The Beats, of course, begat the hippies and the hippies begat the punks; with the punks being the full-stop at the end of the exclamation mark. That's putting it very simply as there was obviously very many other factors and influences involved in the process but without the Beats there would never have been Punk and without Punk I wouldn't be the person I am today and I wouldn't be writing this and you, child, wouldn't be reading it. As George Santayana once said: 'Those who fail to remember the past are condemned to repeat it'.